Photos released to the Mindanao Examiner by the pro-labor group called Bagong Alyansang Makabayan show workers protesting in Davao City in Mindanao on Sunday, May 1, 2011. They demanded for higher wages. 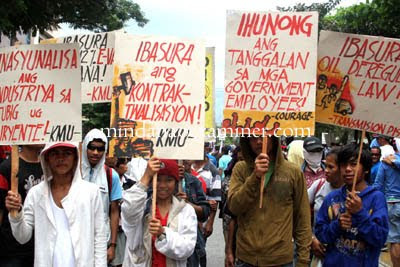 DAVAO CITY, Philippines (Mindanao Examiner / May 1, 2011) – Some 5,000 mostly workers trooped to Davao City in Mindanao on Sunday to protest Manila’s failure to uplift the living conditions of laborers and demanded higher wages. The protesters also rejected proposals by President Benigno Aquino III for non-wage benefits for workers in the country as transport groups and militant organizations also held simultaneous protests on the high cost of oil and other petroleum products. Many of the workers who were protesting are allied or members of the organized unions led by the National Federation of Labor Unions which is also affiliated with the Kilusang Mayo Uno and labor associations of contractual employees. “The march is indicative of the ever present unrest in the country’s labor front no matter how much this government tries hard to placate the people’s outrage. Throughout the region, more workers are getting indignant of the worsening exploitation at the workplace, more people are getting enraged by the escalating prices of goods,” said Franchie Buhayan, Secretary-General of Bagong Alyansang Makabayan in Southern Mindanao. “President Aquino has offered non-wage benefits, palliatives in the form of subsidies and other dole-outs but it refuses to resolutely stem the people’s hardship by confronting outstanding issues on wage and prices,” Buhayan said. Instead of providing substantial wage hikes, Aquino has offered seed money for cooperatives of certain labor groups, scholarships and promises of benefits from various government agencies. “We doubt if such benefits will even reach the workers given said offices' record of corruption of the funds that workers religiously contributed. But the greater issue here is that we have a President who could not face squarely the capitalists, and make these employers provide just wages to the workers whose toil they exploit for profits. In that way, President Aquino could have adequately answered the people’s needs, foremost is surviving the cost of living,” Buhayan said.